A market correction in the fourth quarter, spurred by a number of global macroeconomic concerns and rising interest rates ended up having a negative impact on the markets and many hedge funds as a result. The stocks of smaller companies were especially hard hit during this time as investors fled to investments seen as being safer. This is evident in the fact that the Russell 2000 ETF underperformed the S&P 500 ETF by nearly 7 percentage points during the fourth quarter. We also received indications that hedge funds were trimming their positions amid the market volatility and uncertainty, and given their greater inclination towards smaller cap stocks than other investors, it follows that a stronger sell-off occurred in those stocks. Let’s study the hedge fund sentiment to see how those concerns affected their ownership of Albemarle Corporation (NYSE:ALB) during the quarter. Albemarle Corporation (NYSE:ALB) was in 28 hedge funds’ portfolios at the end of December. ALB has seen an increase in hedge fund interest recently. There were 22 hedge funds in our database with ALB positions at the end of the previous quarter. 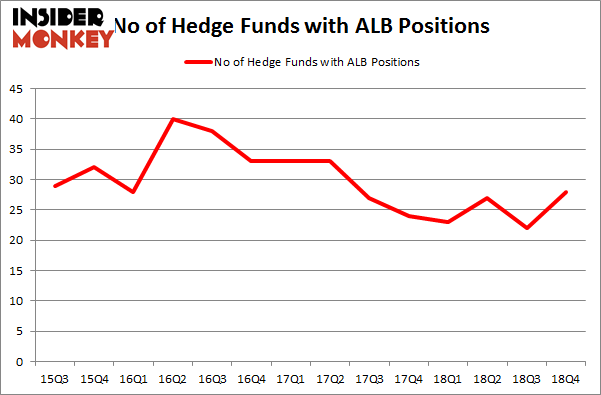 Our calculations also showed that ALB isn’t among the 30 most popular stocks among hedge funds. 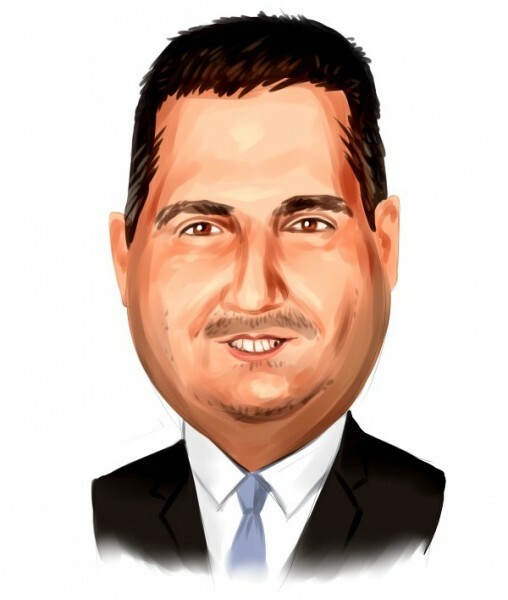 Let’s check out the recent hedge fund action encompassing Albemarle Corporation (NYSE:ALB). How are hedge funds trading Albemarle Corporation (NYSE:ALB)? At Q4’s end, a total of 28 of the hedge funds tracked by Insider Monkey were bullish on this stock, a change of 27% from the previous quarter. By comparison, 23 hedge funds held shares or bullish call options in ALB a year ago. So, let’s see which hedge funds were among the top holders of the stock and which hedge funds were making big moves. More specifically, Iridian Asset Management was the largest shareholder of Albemarle Corporation (NYSE:ALB), with a stake worth $133.2 million reported as of the end of September. Trailing Iridian Asset Management was Citadel Investment Group, which amassed a stake valued at $27.8 million. Glenview Capital, GLG Partners, and Anchor Bolt Capital were also very fond of the stock, giving the stock large weights in their portfolios. Consequently, key hedge funds have jumped into Albemarle Corporation (NYSE:ALB) headfirst. Millennium Management, managed by Israel Englander, assembled the biggest call position in Albemarle Corporation (NYSE:ALB). Millennium Management had $4.5 million invested in the company at the end of the quarter. Matthew Hulsizer’s PEAK6 Capital Management also made a $3.9 million investment in the stock during the quarter. The other funds with new positions in the stock are John Overdeck and David Siegel’s Two Sigma Advisors, Paul Tudor Jones’s Tudor Investment Corp, and Minhua Zhang’s Weld Capital Management. Let’s also examine hedge fund activity in other stocks similar to Albemarle Corporation (NYSE:ALB). These stocks are Amdocs Limited (NASDAQ:DOX), Alliance Data Systems Corporation (NYSE:ADS), Huntington Ingalls Industries Inc (NYSE:HII), and Arconic Inc. (NYSE:ARNC). This group of stocks’ market values are similar to ALB’s market value. As you can see these stocks had an average of 34 hedge funds with bullish positions and the average amount invested in these stocks was $1330 million. That figure was $285 million in ALB’s case. Arconic Inc. (NYSE:ARNC) is the most popular stock in this table. On the other hand Amdocs Limited (NYSE:DOX) is the least popular one with only 24 bullish hedge fund positions. Albemarle Corporation (NYSE:ALB) is not the least popular stock in this group but hedge fund interest is still below average. This is a slightly negative signal and we’d rather spend our time researching stocks that hedge funds are piling on. Our calculations showed that top 15 most popular stocks among hedge funds returned 21.3% through April 8th and outperformed the S&P 500 ETF (SPY) by more than 5 percentage points. Unfortunately ALB wasn’t in this group. Hedge funds that bet on ALB were disappointed as the stock returned 13.3% and underperformed the market. If you are interested in investing in large cap stocks, you should check out the top 15 hedge fund stocks as 12 of these outperformed the market.